What is a Spiritual Stonghold? A few years ago, the Lord showed me a vivid vision as I was awake in the early morning. He showed me our hearts, the spiritual battles we face, much scripture was explained and here I want to share with you what the Lord showed me was a stronghold. These words are true, and oh how I wish everyone could understand the depth of this. What we put in our hearts flows out in four ways- very similar to the physical heart we have within us. The junk or the good we see, hear, do, go …goes straight into our heart. It is like a well within us- it can be flowing with the waters of life through Jesus or we can unknowingly be polluting it with the tv shows, music, words, books we allow to get dumped in. What you put in to your heart can allow the devil to try to control your life- this is the pair of demonic hands that tries to cut you off- ultimately destroying your life. These rivers- for lack of a better word to describe-that flow from your heart actually connect you to the Lord- as if on a vine. The devils grip tries to cut you off. The main goal of a demonic stronghold is to cut off your connector to the Lord- it would be like you tying a tight rubber band on a branch of a vine. It would eventually fall off and die. Well that is what happens here. To understand the working of our enemy here- is to describe it as breaking a branch from a vine off- or cutting off it’s source- to kill the vine so the life is no longer in it. I saw the Lord holding on to His people- some even by a small strand that was left with the strongholds breaking them off. The Lord loves His people so much- as if you were his only son. He has His arms outstretched to you and guards you – but you must, you must, you must Guard and Protect your heart- it’s the wellspring within you- and if you do not protect it and live the way you want to- instead of by the Lord’s way- you will deeply regret the choices you made in your life. John 15:1“I am the true vine, and my Father is the gardener.“I am the vine; you are the branches. If you remain in me and I in you, you will bear much fruit; apart from me you can do nothing. He is the vine- Jesus is explaining what it is like in the spiritual world. This is how we are connected to Jesus- that is how Jesus, the Holy Spirit and our Father God are always with us. In the case I saw, it was a man who had alcohol and gambling addiction. The man had no idea he was being controlled by the demons who had a stronghold on him. He thought to himself “I can beat this, I can overcome this on my own” and the devils laughed and laughed because they knew it would be impossible. This man had at one time been wiped clean and freed from his addictions, but returned to his ways. I finally understood what Jesus said when he said the demons come back and find the place (heart) wiped clean and bring even more back. I could see so many demons there waiting to grab him and break him off, waiting for him to break free-only so the next one in line could put there hands on it next. Behind this man and the demonic stronghold…I could see the man fight and break free and then another demon would grab hold and so it went on and on..the man never freeing himself. Only the blood of Jesus can free us, we in ourselves are powerless to the demonic forces that try to kill us, destroy us, and cut us off from our Heavenly Father. On top of each of the hands I saw the word “stronghold” written. I also so a demonic chokehold around the neck that would choke out the word of God. Everytime this person would go to church or try to hear God’s word the demonic chokehold would grab him around the neck so the Word of God could not go into the heart. YOU CAN HAVE THIS LIVING WATER FLOWING THROUGH YOU– you need it for your salvation. Call out to your Savior- the spring of Living Water. It is a gift for you. Ask for it. Jesus said, “Whoever believes in me, rivers of living water will flow from within them. (can your heart hold this living water or is your heart polluted? John 4:10 Jesus answered her, “If you knew the gift of God and who it is that asks you for a drink, you would have asked him and he would have given you living water.Sir,” the woman said, “you have nothing to draw with and the well is deep. Where can you get this living water? 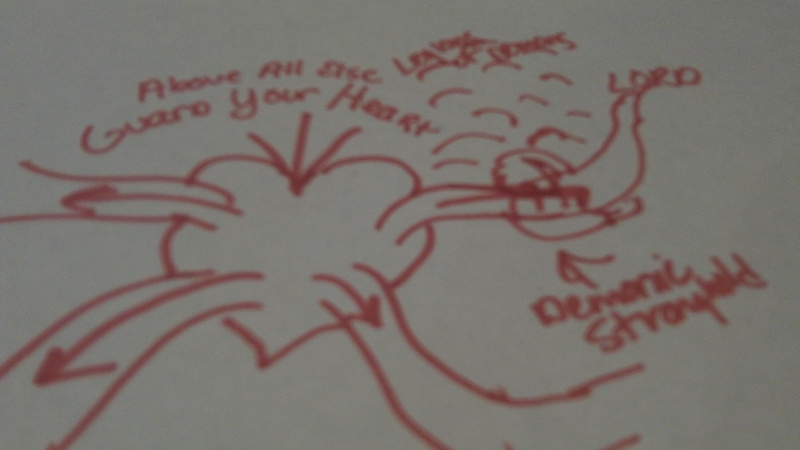 I’m not an artist, but this is part of what I saw- one entrance and 4 outflows throught the heart and on this specific heart I saw one set of demonic hands trying to strangle or cut off the outflow of the heart and behind it were legions ready to jump in just in case the person was freed.